One patient, one hour, as ER meets 24 in Sky's new medical drama. Events play out in real time based on the concept of the 'golden hour', those first 60 minutes after a major trauma that are critical to a patient's survival. Created by Jed Mercurio who as a former doctor and showrunner on Bodies and Cardiac Arrest should know his stuff. Pagers ping and the team all rush to the trauma room. They even start a clock running to reinforce the strict time limit. A warning for the squeamish Critical gets up close and personal focusing on grisly details that could rival Saw. Bones are drilled, chest cavities are opened, skin is peeled, the camera swooping in to follow a scalpel as it slices through flesh. The opening episodes include a suspected car crash, a woman who fell out of a window landing on a fence below (a chunk of wood skewering her face) and a fractured pelvis complicated by a possible Ebola-type virus. It's so patient based, each casualty a mute unconscious lump of meat, there's very little time for character development. Quick, time saving clichés are necessary – Kimberly Nixon is the over eager rookie, Lennie James the gruff ex-military doctor – while the ongoing storyline is crammed into the last five minutes or conveyed via snidey comments and sideways glances. One such example is a lover's tiff is played out over a pregnant gunshot victim. And the complex hospital politics and financial constraints constantly rumble away in the background. This refusal to indulge television's craving to divulge everyone's personal life is actually quite refreshing but the format is so rigid it can become repetitive. The over reliance on technical jargon is also slightly confusing. Given Mercurio's background, the medical procedures may well be accurate but Critical doesn't feel realistic; the impossibly clean, white, neon lit hospital more resembles the Starship Enterprise rather than a working NHS building. That doesn't mean Critical isn't intermittently compelling and heart stoppingly tense. 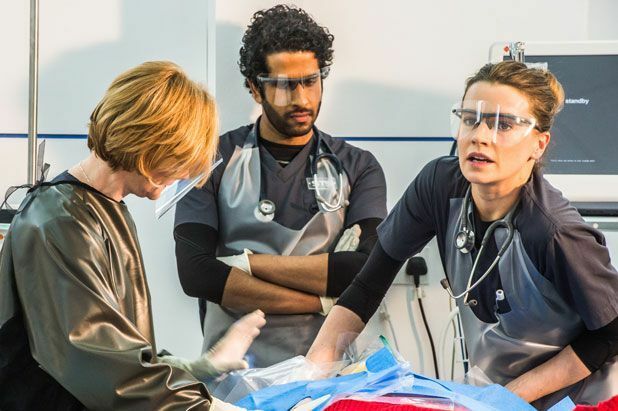 Critical premieres on Sky One, Tue 24 Feb.